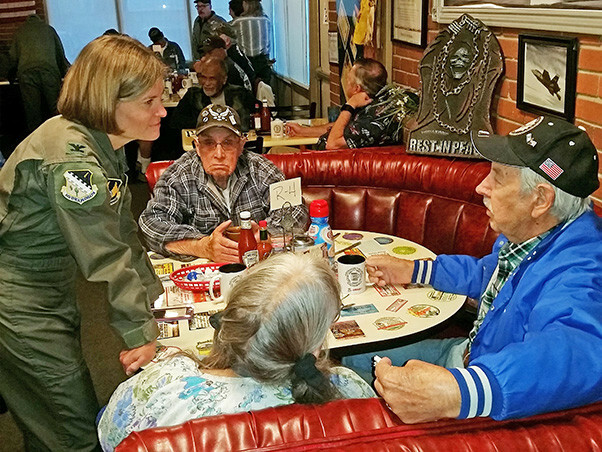 Col. Angela Suplisson, Air Force Test Center vice commander (left), speaks to military veterans at a monthly meeting of Coffee4Vets, a non-profit veterans support organization. The meeting was held at Crazy Otto’s restaurant in Lancaster, Calif., Oct. 24, 2017. Suplisson said she was so impressed by all the stories each veteran had that she would like to bring more active duty Airmen to the event to meet with the veterans. The vice commander is scheduled to be the keynote speaker at the Coffee4Vets Military Ball Nov. 4 in Lancaster.